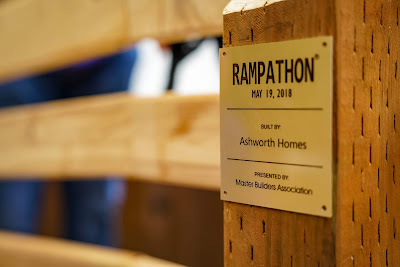 On May 19, 2018 the Master Builders Association of King and Snohomish Counties (MBAKS) celebrated 25 years of Rampathon, an inspiring community event where volunteers build free wheelchair access ramps to improve mobility for families throughout King and Snohomish counties. 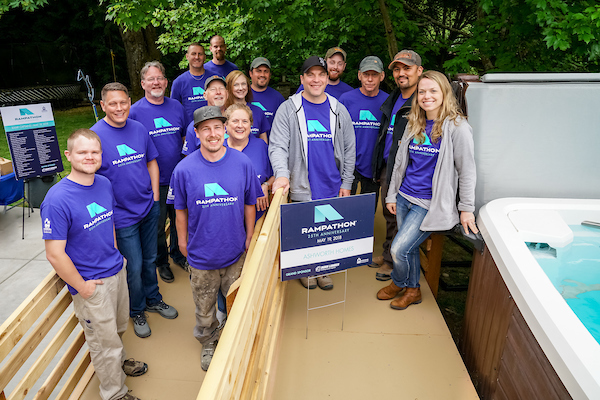 Since 1993, more than 450 ramps have been built and over 30,000 of volunteer hours donated by local builders. This year, MBAKS and its member volunteers constructed a whopping 48 ramps, built by 39 teams. 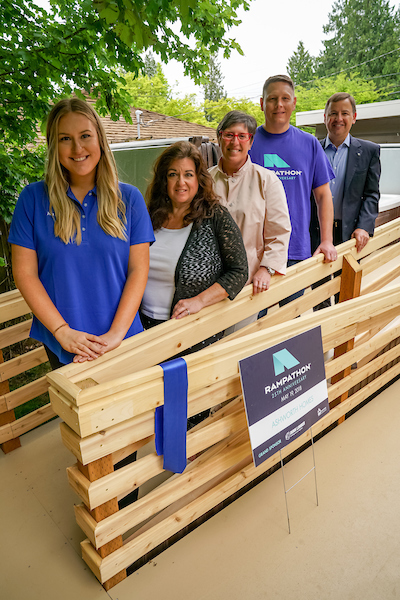 Ashworth Homes of Shoreline was honored to build this year’s Spotlight Ramp for 12-year-old Camille Jefferson. Camille has a rare genetic disorder called Angelman syndrome that affects her ability to walk and talk. She also requires 24-hour care. Angelman syndrome causes severe seizures and an obsession with water. The latter provides Camille sensory input and the ability to move around more freely. As Camille has grown, however, it has become more difficult for her parents to carry her safely into the on-site therapy pool, the only place she feels secure to move around without getting hurt and the only place where the family can spend time together. 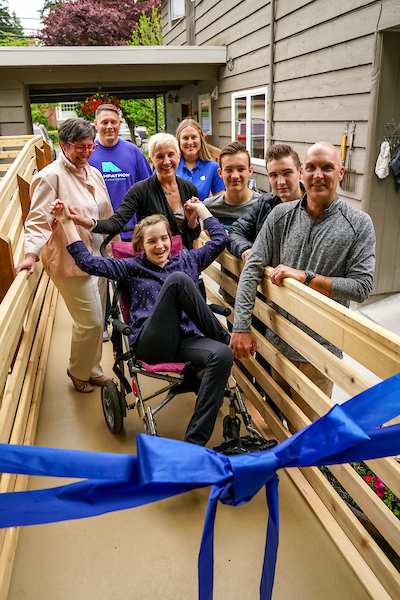 Simply put, building a free ramp gives Camille and her family access to the place they find joy. 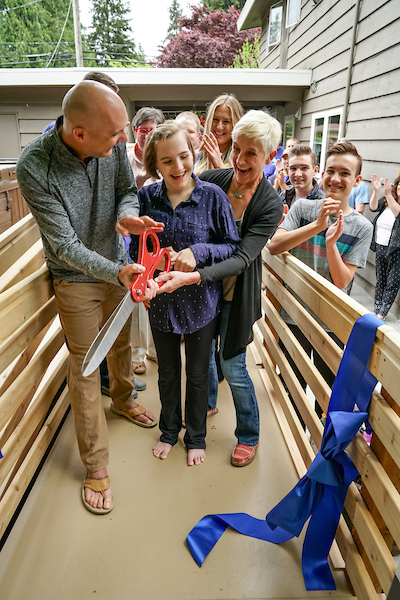 The ribbon-cutting ceremony featuring Camille and family happened on Thursday, May 17. Speakers included MBAKS Director of Programs and Products Aaron Adelstein, Dunn Lumber’s Kathryn Coshow, MBAKS Executive Director Kathleen Sims, Ashworth Homes President Erich Armbruster, and Camille’s dad, Jody Jefferson. King County Councilman Rod Dembowski was on hand to celebrate the ramp build. Ashworth Homes is a Shoreline-based Built Green homebuilder owned by MBAKS’ board president Erich Armbruster. This year’s Ramp Captain was Don Morrell, backed up by the full Ashworth team. Materials to build the ramps are donated by Dunn Lumber, and Ashworth was fortunate to have skirting donated by Marquis, making the ramp not only functional, but beautiful. The ramp is actually safer than the stairs were, and her Mom will be able to get her into the pool without the help of her Dad now. It is built so that her chair can go up to the top and she can be moved to sit on the side of the water and swing her legs in without being dragged backwards. In addition to being a premier residential builder in the Puget Sound region, Ashworth Homes is also an adamant supporter of community building activities. For more than 15 years, Ashworth Homes has supported local foundations, schools, and community celebrations and clean up events. This is the 6th year Ashworth Homes has constructed a ramp in concert with MBAKS.